Last Sunday, we went to a resort with no name in Brgy. Alangilan, Bacolod City, Negros Occidental. Needless to say, it is a new resort with a pool filled with spring water from the mountains. The cottages are made of concrete. There is still so much to be done in this place, but that was fine with us because for a small entrance fee of P30 each for adults and P20 for kids, our purpose of going swimming was achieved. The water was just too cold though! Brrrrr! Anyway, Dindin had her all pink swim wear and pink swimming accessories. The swimsuit was given by Tita Doc Jen as her belated 2nd birthday gift to Dindin. The cute pink hoody was given by Tita Sansan during Dindin’s first Christmas. Papa and Mama bought the pink Disney princess floaters and the pink Minnie Mouse beach ball. I’m sure Dindin had real FUN with all her Pink swimming gears. Cute! Mine is up too. Thanks and see you around! She’s a real cutie! Hope you can drop by my entry. Thanks! cute ni Dindin. 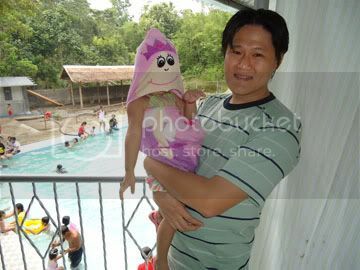 I like that last photo with her daddy..heheh nawala ang face..
Wow galing nmn 30p lng ang entrance for the swimming pool. Galing ah. We very seldom go to swimming pool though it is only 10 minutes walk to a biggest swimming pool area here. Happy Pink Friday, see you in my entry. cute naman ni dindin, i love the all pink swimming gear. Pink Tonic at y home page, have a great weekend! very cute… and the smile,i love it! Late visiting from Pink Friday! 🙂 have a nice day! wow ang cute ni dindin, i bet she enjoyed the fun…seems likes a nice place to be in this summer! have a great week!